Mares 411194 Corrective Lenses for the Mares X-Vision 2014 and Liquidskin Masks are carefully crafted to provide optical clarity. You can chose from negative or gauge reading Bifocal Corrective Lenses. Note: Price is for one lens only. Note: Dioptres increase in 0.5 dioptre increments. Negative dioptre corrective lenses are designed for divers who are Near Sighted. That condition of the ocular refraction in which the posterior principal focus of the eye lies in front of the retinal plane, so that neutral light waves, entering the eye in a state of rest, instead of focusing on the retina, come to a focus before they reach it, are reversed, and fall on the retina in diffusion circles of plus waves. The lenses are available in negative half dioptre increments, from -1.0 to -7.0. Finding the numerals on your gauge too small, especially in the dark? Finding your arm is not long enough, but have pretty good distance vision? If you answered yes to these questions, then you probably have presepobia, a condition where the eye exhibits a progressively diminished ability to focus on near objects with age. On the surface the fix is reading glasses (those things you always forget just when you need them most). Bright light also helps, as it constricts the pupils, and decreases spherical aberration. Some people use prescription bifocals, trifocals or multi-focal lenses. Normal vision for top two thirds and 'reading' (plus) correction for bottom third. 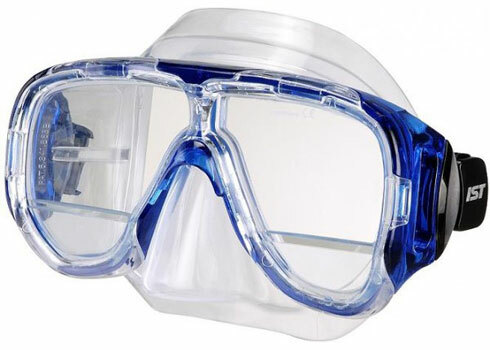 Under water the solution is a 'eader' mask fitted with what the dive industry refers to as bifocal corrective lenses. These underwater bifocal corrective lenses aren't quite what people are used to with bifocal prescription glasses. With Gauge Reader dive mask bifocal corrective lenses, the lower pane (roughly a third) has the reading correction, and the rest of the lens is 'Normal' or 'Plano'. That's why they're referred to as Gauge Reading lenses. So you need to know the dioptre value for your reading glasses. The Mares 411194 Bifocal / Gauge Reading corrective lenses are available in a dioptre range of +1.5 to +3.0, in 0.5 dioptre increments. If you have a quarter dioptre prescription, then you should probably increase to the next higher/stronger dioptre, but check with your optometrist first. Your eyes will inevitably change and within a few years you will need the stronger dioptre. Please note the price is per lens, not for a set. Should your prescription be the same for both eyes please just order your required strength x 2.